Sarri's side made it three wins in nine days thanks to goals from Pedro, Willian and substitute Callum Hudson-Odoi, but should be taking a far greater aggregate lead to Ukraine for next week's return match. It was the Spaniard's ninth goal of the season and he should have doubled the advantage minutes later when he fired straight at Boyko with the goal gaping following Davide Zappacosta's low centre from the right. Former Barcelona forward Pedro had another attempt pushed away by Boyko having raced on to David Luiz's raking pass, while Ross Barkley and Alonso also threatened in a one-sided opening period. It was Sarri's substitutions which eventually inspired the overdue additional goals, starting with the second in the 65th minute. Ruben Loftus-Cheek, brought on in place of Barkley, was fouled on the edge of the box and Willian, formerly of Dynamo's rivals Shakhtar Donetsk, brilliantly curled the resultant set-piece into the top left corner with Boyko this time rooted to the spot. 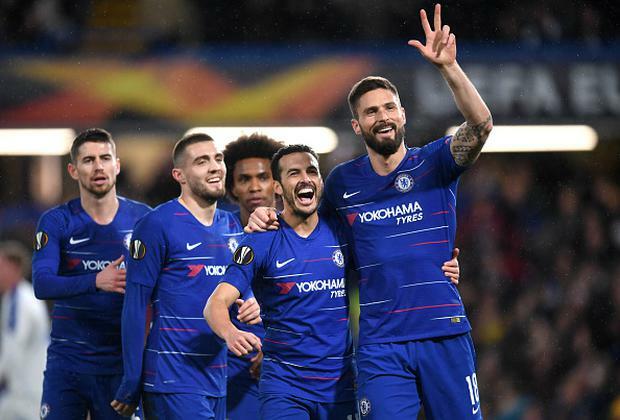 That miss looked likely to leave the Ukrainian runners-up with a glimmer of hope going into next Thursday's second leg, before a third in the final minute put Chelsea in a commanding position.